Určite ste zaregistrovali, že počas prehliadky Elie Saab jedna modelka stratila rovnováhu a spadla na pódiu. Nie je to nič nezvyčajné, ale určite to vzbudí pozornosť. Veď napokon chodiť v 2 číslach väčších topánkach + uletené dizajnérske kreácie nie sú pre modelky žiadna malina. A ak aj modelka spadne, tak návrhár má aspoň o chvíľkovú slávu postarané- ak už nič iné. Viem, že niekomu to príde úbohé smiať sa na cudzom nešťastí, ale musíte uznať, že niektoré pády sú naozaj komické. I´m sure you have noticed that during Elie Saab show, one model lost a balance and she fell on catwalk. It´s nothing unusual, but it makes a splash. 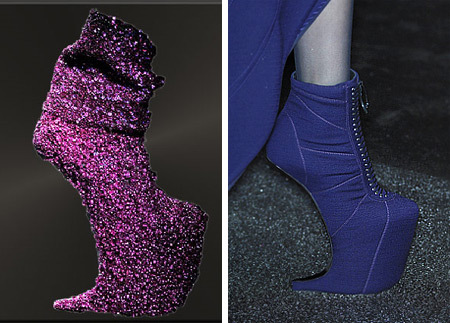 After all, walking in 2 sizes bigger shoes + crazy designers´ creations are not easy for models to wear. And if model falls, then designer will have cared for a fame- if nothing else. I know that for someone it seems to be pathetic to laught at unhappiness of others, but you have to admit that some fails are really funny. Tu je zopár fotiek asi najčudnejších topánok aké som videla. Obdivujem (a zároveň ľutujem) tých, ktorí ich mali aspoň raz na sebe. 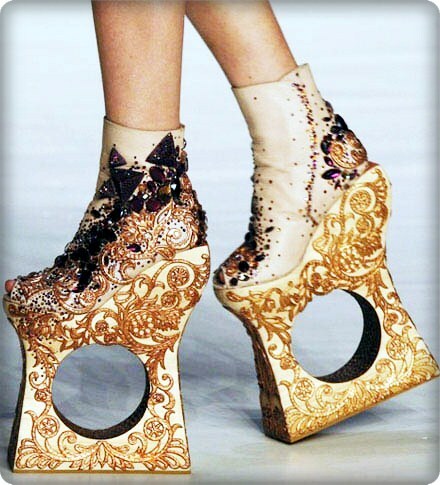 And here are few pics, probably the most strange shoes I´ve ever seen. I admire (and regret at the same time) the ones, who wore them at least once. From the bottom of my heart, I feels very bad and sorry for those models are! How awful :(. especially the one that felt into the pool and the model who felt and disappeared underneath the catwalk, hope she wont get hurt badly. Big sighhhh, But thank you so much for sharing the moment with us! I feel sorry for these poor models, this is should be awful!!! 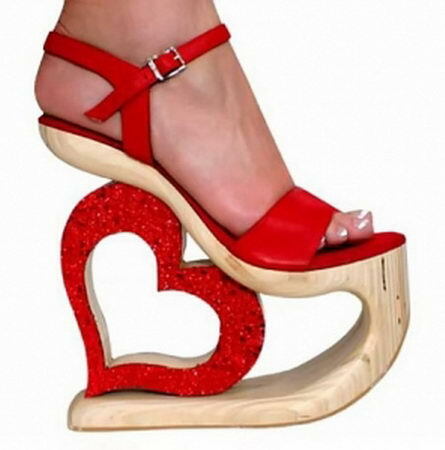 it's no wonder they fall when they walk in shoes like those!! Zaregistrovala som a je to fest sila...mnohé si často veľmi, veľmi ubližía a keď padne niekoľkokrát môže to uškodiť kariére...je to hnusné fakt ale čo už...to k modelingu patrí...Ale tie veľkosti topánok ma dosť desia... a hnevajú zároveň. Funny pics... original post Lia!!!! Yeah some shoes are just.........uhm for fashion photos only.......I'm wondering if there is anyone who really would buy those shoes and actually wear them? Great post darling, thx for sharing. absolutely in love with this post... fashion shows are over the top... thats what draws people towards them! With those shoes it's impossible stay up! Lol the first photo is just too funny and those shoes.. Omg what the hell!! Hahaha great post! Made my day! Have a nice day! :). Oh these are funny yet sad at the same time! Kiss, kiss my beautiful friend!!!! didn't see about this from Elie Saab, but it happens...and with those shoes sometimes is not possible to stand up! Amiga que post maravilhoso amei os vídeo, sucesso uma boa noite. OMG! Watching this video made me cringe! I can just feel for their ankles! The one where the girl lost her shoe completely is crazy! They are able to recover well though! Hahah these are too good! The shoes they wear are too hard to walk in. In addition to the pressure when all eyes are on them. Cool post! Thanks for sharing. 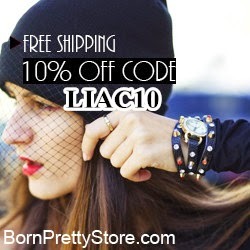 Lia, Thank you for your comment on my blog - You do not need an etsy account to enter the giveaway! Kisses Lia, have a fab evening!!!! Oh no, poor models!! Who can walk on those shoes?